Marathon swimming is one of the ultimate tests of both the human body and the mind but endurance swimming against the elements is not for the meek and weak-willed. Marathon swimming is long distance open water swimming. It is a trial of endurance that pits a lone swimmer against the forces of nature. Marathon swimming refers to any open water event that is further than 10 kilometres. Oceans, lakes and rivers are classed as open waters and popular marathon swimming locations include the English Channel and the USA’s Great Lakes. Marathon swimming is an international sport governed by the Fédération Internationale de Natation (FINA) and there are many organised marathon swimming competitions around the world. Outside of its community the most publicised swims are those undertaken solo. The swims are accompanied by a boat crew that monitor and coach the swimmer, and provide liquid and food sustenance if appropriate. The many risks associated with marathon swimming relate to either the dangers of the open waters, such as rip tides, waves, bad weather and cold waters, or the dangers of swimming long distance, such as exhaustion and muscle injury. Marathon swimming is far from a leisure sport, it is a brutal test of the human body. It requires stamina, strength, speed and the mental resolve to keep on going against all odds. Marathon swimmers must also be able to withstand hours in very cold temperatures. Swimmers need to be physically fit and follow a strict long-term training programme, which typically includes cross training with running or cycling. Swimmers with short arms and legs, and well-distributed body fat are said to have an advantage in terms of maintaining body heat in the freezing open waters. The only equipment a marathon swimmer needs is a swim suit. 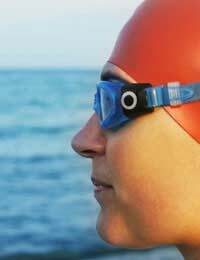 A brightly coloured swim cap is also recommended to improve visibility in the water. Many swimming competitions will also request its participants wear one for identification. The rules of the FINA forbid the use of wetsuits. Swimmers wearing such suits have an unfair advantage because the water wear provides extra buoyancy that supposedly can aid the speed and endurance of the wearer. The marathon swimming governing bodies refuse to recognise or monitor swims carried out wearing wetsuits. These are classed as aided swims and not pure marathon swims. As the marathon swimmer has no wetsuit to keep them insulated against the cold, they must use plenty of lubrication. This lubrication also helps avoid underarm of inner-thigh chafing. When the first person swam the English Channel in 1875 they were slathered in porpoise fat. Goose fat is the mammal fat of choice these days, but more often swimmers opt for a specially prepared grease. The Channel Swimmer’s Grease, for example, is a 50/50 mix of lanolin and Vaseline. Good nutrition before and during the swim is recommended for a safe and successful crossing. Solo swimmers keep their energy levels topped up throughout their journey with small regular snacks of items such as energy drinks, bananas, carbohydrate gels and chocolate bars.